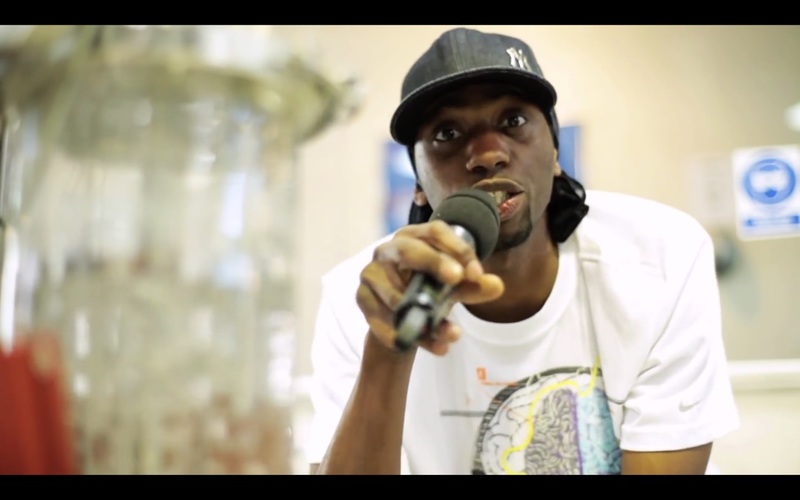 WHEN DID YOU START RAPPING ABOUT SCIENCE? I wrote a random rap about the scientific method and, many years later, I rapped it to my professor on the way to an astrobiology conference. He suggested I rap it to one of the organisers, who happened to work for NASA’s Astrobiology Magazine. She asked me to write a rap for them. That astrobiology rap and video became my first science rap, back in 2008. By then, I was completing an MSc in Communicating Science. 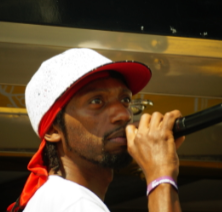 HOW DID RAPPING ABOUT SCIENCE BECOME A CAREER? The following month I wrote some more raps to perform alongside my professor at various venues. Some were performed at a school and others were performed with my professor at the first ever Science Museum Lates event in London. The publicity from this event, alongside my rap for NASA, catapulted me onto national TV, radio and in international newspapers! This is when my existence as a UK science rapper really took off – especially on the internet. Requests soon followed for science rap-related activities such as workshops and bespoke raps. 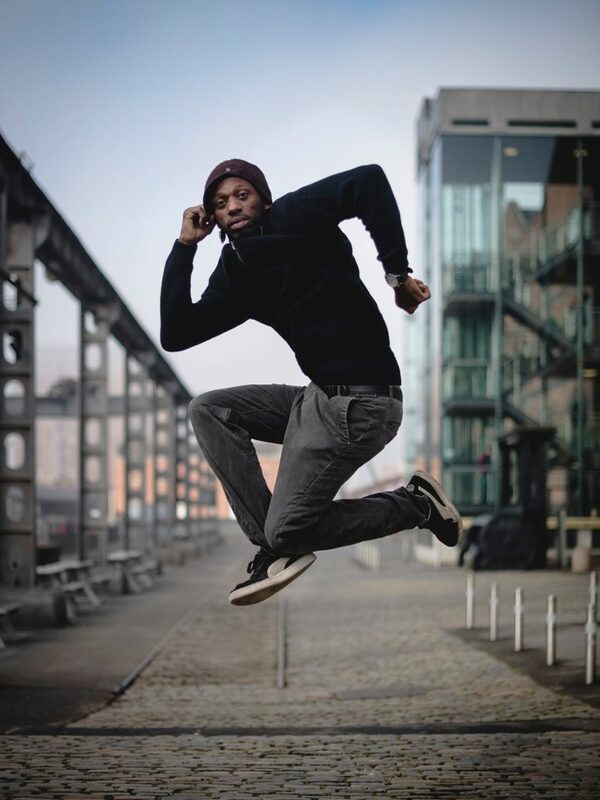 Rapping about science became my niche within science communication. It was also the topic of my final dissertation. DO YOU THINK THAT COMMUNICATING IDEAS VIA RAP MAKES SCIENCE MORE ACCESSIBLE? I’d like to think so. Linking information to people’s own interests and experiences can make it easier for a person to engage with it. Generally, it’s about finding different ways to relate with the audience. I use rap as a vehicle to ease communication, but it could be anything else that a person’s into: movies, games, music or some other pastime. IS IT DIFFICULT TO MAKE YOUR RAPS FUN WITHOUT DUMBING DOWN THE SCIENCE? People like raps for different reasons so I guess it mainly depends on the audience. A scientist or student might find my raps fun because I’m accurately rhyming about things they’re familiar with. Then there are some people who are just happy that they’re watching a performance from a rapper. As a rapper, my role is to fit words onto a beat or rhythm in a way that appeals to the listener. As a science communicator, my role is to pitch scientific information in a way that suits the people I’m talking to. I don’t necessarily see it as dumbing down, but rather as saying things in a way that helps people to engage. For example, my most popular rap is about the Periodic Table, which literally drops the scientific information! There’s only a limited amount of time to get a message across, though, so people can’t use rap to get a deeper understanding of a subject. I suppose that’s what the education system is there to provide. WHAT HAS BEEN YOUR FAVOURITE RAP PROJECT SO FAR? 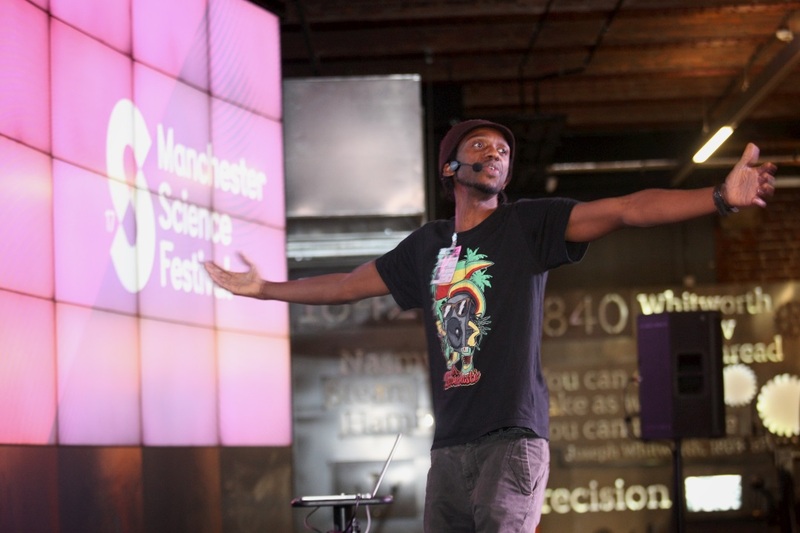 Putting together a hip hop event for Manchester Science Festival as part of the Josh Award, which I received in 2017. It was amazing to be able to develop an event where the public could listen to science raps from the UK and US, engage with the science of how turntables work, and play with some augmented reality science graffiti pieces. YOU HAVE A DEGREE IN AEROSPACE ENGINEERING. WHO, OR WHAT, INSPIRED YOU TO STUDY STEM (SCIENCE, TECH, ENGINEERING AND MATHS) SUBJECTS? To be honest I think it was probably science fiction! I wanted to be the scientist with all the answers, or the inventor who could create the impossible in their shed or basement. 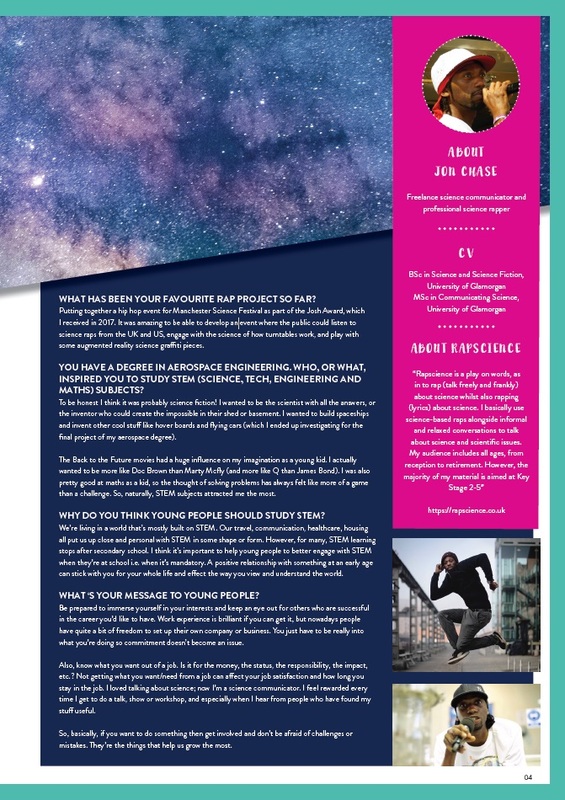 I wanted to build spaceships and invent other cool stuff like hover boards and flying cars (which I ended up investigating for the final project of my aerospace degree). The Back to the Future movies had a huge influence on my imagination as a young kid. I actually wanted to be more like Doc Brown than Marty Mcfly (and more like Q than James Bond). I was also pretty good at maths as a kid, so the thought of solving problems has always felt like more of a game than a challenge. So, naturally, STEM subjects attracted me the most. WHY DO YOU THINK YOUNG PEOPLE SHOULD STUDY STEM? We’re living in a world that’s mostly built on STEM. Our travel, communication, healthcare, housing all put us up close and personal with STEM in some shape or form. However, for many, STEM learning stops after secondary school. I think it’s important to help young people to better engage with STEM when they’re at school i.e. when it’s mandatory. A positive relationship with something at an early age can stick with you for your whole life and affect the way you view and understand the world. WHAT ‘S YOUR MESSAGE TO YOUNG PEOPLE? Be prepared to immerse yourself in your interests and keep an eye out for others who are successful in the career you’d like to have. Work experience is brilliant if you can get it, but nowadays people have quite a bit of freedom to set up their own company or business. You just have to be really into what you’re doing so commitment doesn’t become an issue. Also, know what you want out of a job. Is it for the money, the status, the responsibility, the impact, etc.? Not getting what you want/need from a job can affect your job satisfaction and how long you stay in the job. I loved talking about science; now I’m a science communicator. I feel rewarded every time I get to do a talk, show or workshop, and especially when I hear from people who have found my stuff useful. So, basically, if you want to do something then get involved and don’t be afraid of challenges or mistakes. They’re the things that help us grow the most. Check out Jon’s first ever rap about astrobiology, created for the public in 2008! Just be aware, that this video is hosted on YouTube. We cannot be held responsible for the content shown after the video has ended. Hi Jon. I’ve just come across you and Futurum. Why haven’t I heard of you before?! Thanks for the message. Whats the best way to get in touch?